"Kanagawa" redirects here. For other uses, see Kanagawa (disambiguation). Kanagawa Prefecture (神奈川県, Kanagawa-ken) is a prefecture located in Kantō region of Japan. The capital of the prefecture is Yokohama. Kanagawa is part of the Greater Tokyo Area. Kanagawa Prefecture is home to Kamakura and Hakone, two popular side trip destinations from Tokyo. The prefecture has some archaeological sites going back to the Jōmon period (around 400 BCE). About 3,000 years ago, Mount Hakone produced a volcanic explosion which resulted in Lake Ashi on the western area of the prefecture. It is believed[by whom?] that the Yamato dynasty ruled this area from the 5th century onwards. In the ancient era, its plains were very sparsely inhabited. In medieval Japan, Kanagawa was part of the provinces of Sagami and Musashi. Kamakura in central Sagami was the capital of Japan during the Kamakura period (1185–1333). During the Edo period, the western part of Sagami Province was governed by the daimyō of Odawara Castle, while the eastern part was directly governed by the Tokugawa shogunate in Edo (modern-day Tokyo). Commodore Matthew Perry landed in Kanagawa in 1853 and 1854 and signed the Convention of Kanagawa to force open Japanese ports to the United States. Yokohama, the largest deep-water port in Tokyo Bay, was opened to foreign traders in 1859 after several more years of foreign pressure, and eventually developed into the largest trading port in Japan. Nearby Yokosuka, closer to the mouth of Tokyo Bay, developed as a naval port and now serves as headquarters for the U.S. 7th Fleet and the fleet operations of the Japan Maritime Self-Defense Force. After the Meiji period, many foreigners lived in Yokohama City, and visited Hakone. The Meiji government developed the first railways in Japan, from Shinbashi (in Tokyo) to Yokohama in 1872. The epicenter of the 1923 Great Kanto earthquake was deep beneath Izu Ōshima Island in Sagami Bay. It devastated Tokyo, the port city of Yokohama, surrounding prefectures of Chiba, Kanagawa, and Shizuoka, and caused widespread damage throughout the Kantō region. The sea receded as much as 400 metres from the shore at Manazuru Point, and then rushed back towards the shore in a great wall of water which swamped Mitsuishi-shima. At Kamakura, the total death toll from earthquake, tsunami, and fire exceeded 2,000 victims. At Odawara, ninety percent of the buildings collapsed immediately, and subsequent fires burned the rubble along with anything else left standing. Yokohama, Kawasaki and other major cities were heavily damaged by the U.S. bombing in 1945. Casualties amounted to more than several thousand. After the war, General Douglas MacArthur, the Supreme Commander of the Allied Powers for the Occupation of Japan, landed in Kanagawa, before moving to other areas. U.S. military bases still remain in Kanagawa, including Camp Zama (Army), Yokosuka Naval Base, Naval Air Station Atsugi (Navy). In 1945, Kanagawa was the 15th most populous prefecture in Japan, with the population of about 1.9 million. In the years after the war, the prefecture underwent rapid urbanization as a part of the Greater Tokyo Area. The population as of September 1, 2014, is estimated to be 9.1 million. 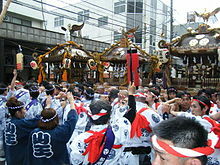 Kanagawa became the second most populous prefecture in 2006. Kanagawa is a relatively small prefecture located at the southeastern corner of the Kantō Plain wedged between Tokyo on the north, the foothills of Mount Fuji on the northwest, and the Sagami Bay and Tokyo Bay on the south and east. The eastern side of the prefecture is relatively flat and heavily urbanized, including the large port cities of Yokohama and Kawasaki. The southeastern area nearby the Miura Peninsula is less urbanized, with the ancient city of Kamakura drawing tourists to temples and shrines. The western part, bordered by Yamanashi Prefecture and Shizuoka Prefecture on the west, is more mountainous and includes resort areas like Odawara and Hakone. 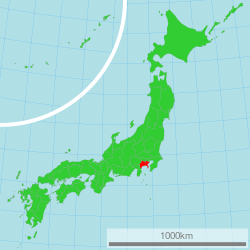 The area, stretching 80 kilometres (50 mi) from west to east and 60 kilometres (37 mi) from north to south, contains 2,400 square kilometres (930 sq mi) of land, accounting for 0.64% of the total land area of Japan. As of 1 April 2012[update], 23% of the total land area of the prefecture was designated as Natural Parks, namely the Fuji-Hakone-Izu National Park; Tanzawa-Ōyama Quasi-National Park; and Jinba Sagamiko, Manazuru Hantō, Okuyugawara, and Tanzawa-Ōyama Prefectural Natural Parks. Topographically, the prefecture consists of three distinct areas. The mountainous western region features the Tanzawa Mountain Range and Hakone Volcano. 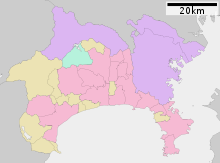 The hilly eastern region is characterized by the Tama Hills and Miura Peninsula. The central region, which surrounds the Tama Hills and Miura Peninsula, consists of flat stream terraces and low lands around major rivers including the Sagami River, Sakai River, Tsurumi River, and Tama River. The Tama River forms much of the boundary between Kanagawa and Tokyo. The Sagami River flows through the middle of the prefecture. In the western region, the Sakawa (river) runs through a small lowland, the Sakawa Lowland, between Hakone Volcano to the west and the Ōiso Hills to the east and flows into Sagami Bay. The Tanzawa Mountain Range, part of the Kantō Mountain Range, contains Mount Hiru (1,673 m or 5,489 ft), the highest peak in the prefecture. Other mountains measure similar mid-range heights: Mount Hinokiboramaru (1,601 m or 5,253 ft), Mount Tanzawa, (1,567 m or 5,141 ft), Mount Ōmuro (1,588 m or 5,210 ft), Mount Himetsugi (1,433 m or 4,701 ft), and Mount Usu (1,460 m or 4,790 ft). The mountain range is lower in height southward leading to Hadano Basin to the Ōiso Hills. At the eastern foothills of the mountain range lies the Isehara Plateau and across the Sagami River the Sagamino plateau. Kanagawa's transport network is heavily intertwined with that of Tokyo (see: Transportation in Greater Tokyo). Shin-Yokohama and Odawara stations on the Tōkaidō Shinkansen are located in the prefecture, providing high-speed rail service to Tokyo, Nagoya, Osaka, and other major cities. The Kanagawa Prefectural Board of Education manages and oversees individual municipal school districts. The board of education also directly operates most of the public high schools in the prefecture. Todoroki Athletics Stadium—in Kawasaki, the final venue of 2007 IFAF World Cup (American football). Kawasaki Stadium—former homeground of Taiyo Whales (now Yokohama BayStars) and Lotte Orions (now Chiba Lotte Marines). Enoshima Yacht Course—used for 1964 Summer Olympics. Hakone Ekiden Course—from Tokyo to Hakone, 108.0 km, mostly on Japan National Route 1 and Route 15. Runners run on the divided route for ten parts on January 2 (to Hakone) and January 3 (to Tokyo) every year. Lake Sagami—hosted canoeing and rowing for the 1964 Summer Olympics. Yokohama BayStars (Yokohama)—Yokohama Stadium, and Yokosuka Stadium (for its farm team, "Shonan Searex"). Stephen Sondheim's stage musical Pacific Overtures, about the "opening" of Japan to Western influence by Commodore Perry, contains the song "Welcome to Kanagawa". The main team in the Japanese manga and anime series Slam Dunk, Shohoku, is from Kanagawa. The Hinata Inn and surrounding town from the manga and anime series Love Hina are located in Kanagawa. The Japanese manga series Elfen Lied takes place in Kanagawa, mainly in Kamakura and Enoshima (Fujisawa). The Japanese manga and anime series Kenkō Zenrakei Suieibu Umishō takes place in the fictional Kanagawa city of Umineko. The Japanese anime series Gundam Wing's early episodes feature Kanagawa prominently, mainly Yokohama and Yokosuka. The Japanese anime and manga series Area no Kishi takes place in Kanagawa, mostly Kamakura. The Japanese anime and manga series Hamatora takes place in Kanagawa, mainly in Yokohama. The Japanese anime and manga series His and Her Circumstances takes place in Kanagawa Prefecture, mainly in Kawasaki city and Yokohama. A team from the Japanese anime and manga series Kuroko's Basketball, Kaijo, is from Kanagawa. The Japanese anime and manga series Yowamushi Pedal, Hakone Academy is from Hakone, Kanagawa. The Japanese anime and manga series Initial D Fifth Stage is set in Kanagawa, and Final Stage is set in Hakone. ^ Nussbaum, Louis-Frédéric. (2005). "Kanagawa" in Japan Encyclopedia, p. 466, p. 466, at Google Books; "Kantō" in p. 479, p. 479, at Google Books. ^ Nussbaum, "Yokohama" in pp. 1054–1055, p. 154, at Google Books. ^ Nussbaum, "Provinces and prefectures" in p. 466, p. 466, at Google Books. ^ Hammer, Joshua. (2006). Yokohama Burning: the Deadly 1923 Earthquake and Fire that Helped Forge the Path to World War II, p. 278, p. 278, at Google Books. ^ Hammer, pp. 114–115, p. 114, at Google Books. ^ Hammer, pp. 115-116, p. 115, at Google Books. ^ Hammer, p. 113, p. 113, at Google Books. ^ 神奈川県人口統計調査公表資料 (Report). 2014. Archived from the original on 2014-10-13. ^ "General overview of area figures for Natural Parks by prefecture" (PDF). Ministry of the Environment. Archived (PDF) from the original on 21 April 2012. Retrieved 16 August 2012. ^ "Friendly/Sister Affiliations of Kanagawa Prefecture and the Municipalities : Kanagawa". 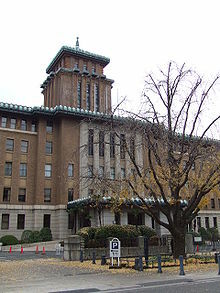 Kanagawa Prefectural Government. February 1, 2016. Archived from the original on July 19, 2016. Retrieved July 17, 2016. ^ "Memorándum de Entendimiento entre el Estado de Aguascalientes, de lo s Estados Unidos Mexicanos, y el Gobierno de la Prefectura de Kanagawa, Japón" (PDF). Archived (PDF) from the original on 2017-12-04. Retrieved 2017-12-04. Wikimedia Commons has media related to Kanagawa prefecture. Wikivoyage has a travel guide for Kanagawa Prefecture.